New developments in instruction in ways of learning II !! Announcing the 13th seminar by the SAOL. The SAOL has been pursuing ‘collaborative’ learning ‘through the whole body’. The SAOL has developed over 100 educational activities (dramawork, warm-ups, presentations, and more) which are universally applicable across school types — from the elementary through tertiary levels — or subjects, with a view to promoting active learning. Moreover, Vol. 4 of the SAOL series ‘Handbook for directors of learning’ is scheduled to be published from Gakuji Shppan Publishing this summer. The series proposes comprehensive use of educational activities. What are we teachers to do in order to design and administer exciting learning experiences? Although the seminar this summer follows the same format as last year’s, we believe the contents will be much more enriched. Participants can choose from various menus, which show the accumulation of the SAOL’s accomplishments over the past ten years. They can experience a total of two workshops — one from the morning sessions and another from the afternoon sessions. The most essential part is that they enjoy active learning themselves, actually moving their hearts and bodies. Fujimitsu Yuko, a member of the SAOL residing in France, will be coming back to Japan as she did last year to report on ‘The second all-France inter-highschool assembly for presentations in the Japanese language’. At the assembly, French high school students learning the Japanese language gave presentations in groups under the theme of ‘Key persons for exchanges between France and Japan’. The students had chosen, interviewed, and undertaken research on individuals whose significant contributions to cultural exchanges and mutual understanding between the two countries had impact on the society of their counterpart. As for the styles of presentation, the students used not only PowerPoint but also the shadow show, make-believe speech, a skit where presenters came out from the back of a picture of a hand-drawn car, displaying their contrivances. Also, the presentations and questions and answers were done in Japanese. The audience was overwhelmed by the students’ ability and the quality of their presentations. This is proof that learning was done in diverse ways, including language learning as well as intercultural learning, research, and expressive work. Fujimitsu will give a first-hand account of the assembly as a planner and administrator of the event. Participants are invited to join the SAOL in discussing issues of ‘assessment’ of information-based educational projects and those of support for processes of learning, referring to the report. Participants can choose two workshops — one from the morning sessions and another from the afternoon sessions. A brief introduction of each work is given below. For successful facilitation of warm-up games, quick judgment and action are required for various situations. In addition to knowing multiple games, facilitators need to create an atmosphere before the start, choose an appropriate game basing on observation of participants, and explain the rules both verbally and physically, among others. During the workshop, the facilitator will give an account of what he sees, hears, thinks, and does, as games are being played. Participants will experience either hot seating, make-believe presentations, or the mantle of the expert as a starter for presentations for elementary school children through to adults. They are expected to introduce their ideal town after 30 years from now, basing on research work and discussion. They are free to do research on the politics, education systems, and/or buildings, as well as become mayor or a reporter in their presentations. This is a cross-curriculum programme. During drama work, students and/or teachers put themselves in the shoes of a character, and think and feel as the character by approaching an object while taking on a role. This activity provides a learner with ‘a different world’ from the one visible to the eye. This dramatic activity, which allows a learner to think and act as a character, is an effective approach to deepen their learning. It is the hope of the facilitator that participants can experience this basic activity. The term dramacation is coined from ‘drama’, ‘communication’, and ‘education’. Dramacation refers to activities of dramatic methods and elements. Dramacation Spread Centre has developed a range of active menus which have elements of ‘play’ out of basic trainings for actors. The menus are packed with elements to nurture human relationships such as ‘relax’, ‘concentration’, and ‘feeling company (surroundings)’. Participants can experience the process of approaching and sharing relationships with others through physical senses. Do you know the ‘KP method’? It is a way of communicating your ideas in a handy and easy-to-understand manner, and is also a tool for organizing your thought. In addition to the regular ‘KP method’, useful for presentations for exploratory learning and everyday lessons, there is the ‘mini KP method’. Participants will experience these two kinds this time. Educational presentations to be used in your lessons. One major feature of educational presentations is that they can be used not only as presentations at the end of a project but also as an incentive for learning and/or a trigger for questions. By actually going through a making of a presentation, the participants will gain a chance to consider the positions of presentation in the process of a lesson. The ‘Mississippi’ runs through nearly the center of the vast land of North America, flowing from its northern source at Lake Itasca, Minnesota, through the towns of New Orleans in the south to the Gulf of Mexico. As indigenous people in America have righteously called it, it is indeed a ‘gigantic river’. Participants of this workshop will share their ideas of the ways of life of an African American with nature and culture of the Mississippi, by incorporating dramatic methods. Special activities (Tokkatsu) are ‘made in Japan’, and they are educational activities Japan can boast of to the world. They are, however, often treated lightly. A study of the history of Tokkatsu will reveal its deep connection with drama education. After experiencing the significance and challenges of Tokkatsu, participants will have a chance to jointly create a nice programme of Tokkatsu!! 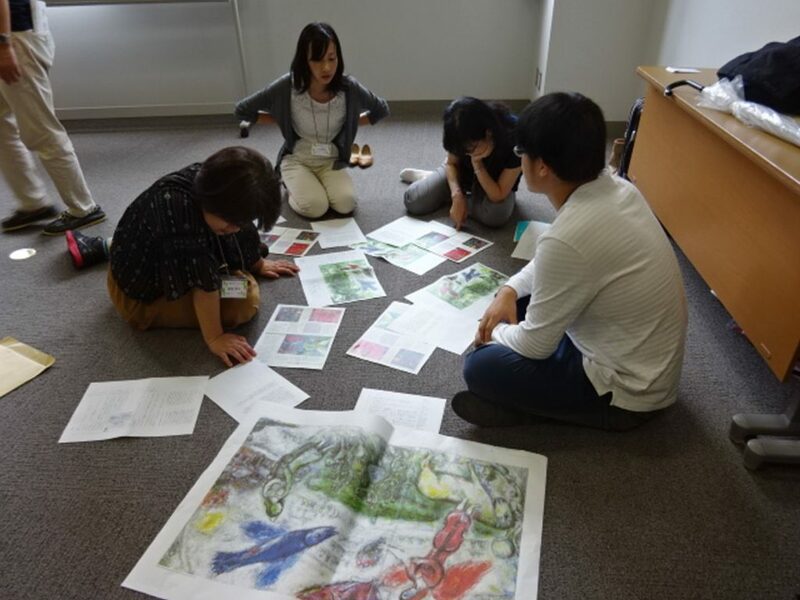 The facilitator hopes that participants can gain useful insights into practicing lessons of Tokkatsu, as instructions based on the new courses of study have been in effect at elementary schools and middle schools since the beginning of this academic year. Participants can attend one workshop each from A (morning) and B (afternoon). Please enter your preferences to third choice. The SAOL will do its best to assign participants to their first choices, but in case there should be significant imbalance in the number of participants across workshops, this cannot be guaranteed. In such a case, some participants will be assigned to their second or third choices. Participants will be notified of their assignment of workshops at the door. There will be a reflection time at the end of the day, when all participants, coming from all parts of the country (or of the world, hopefully), can get together and talk. Participants are encouraged to make the most of this opportunity and expand their network of learning. The SAOL is waiting for your attendance. This entry was posted in SAOL Seminars on 29/05/2018 by staff. 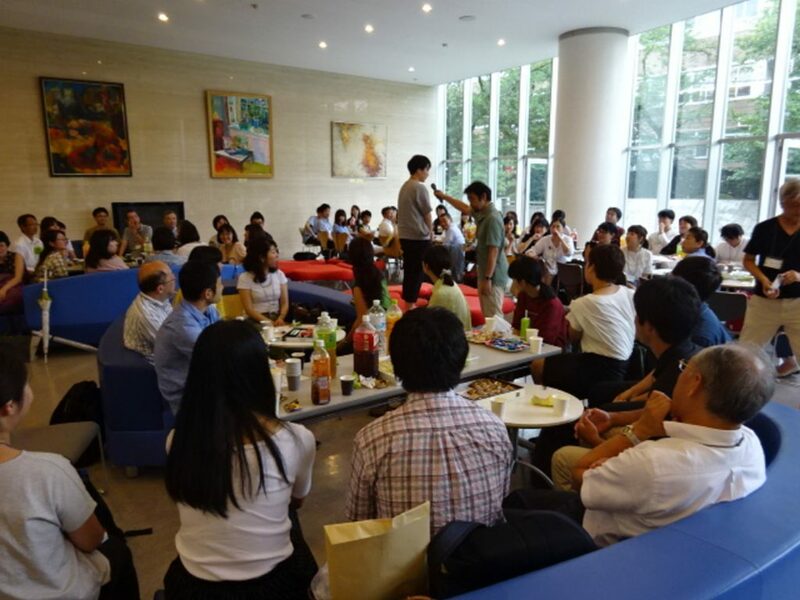 The 11th SAOL Summer Seminar was held on August 7, (Sun), deepening our path to active learning. We are thankful to a number of educators who attended the seminar. ◆ There was a participation of a total of 75 people, including those who participated from abroad. As the current feature, a lot of teachers in active service from elementary schools to high schools joined. It was the first time for many of them to join our SAOL seminar. ◆ The morning program began with a warm-up activity, moving on to a plenary session. Following the keynote proposals on active learning, two of the reporters introduced the practices and knowledge titled “My activities leverage surgery”. ◆ Following the session, workshops were held. Each workshop had two facilitators and each one had a completely different theme and involved the participants by using a different approach. Young participants to veteran participants, with excitement and an unrestrained manner, enjoyed the world of learning. ◆ At the end of the day, a tea party was held. All the participants enjoyed various activities such as “business card exchange game”, “walk & gather” and “Let’s share the ideas.” Even after the time was up, it was impressive to see a number of groups still working. This entry was posted in SAOL Seminars on 07/08/2016 by staff. Our annual spring seminar was held on 26 March. The seminar marked the end of our third term. The title was ‘Enjoy communication and educational presentations through the whole body’. It was a lively event with sixty-one participants. The seminar was opened with a warm-up activity by Ms Fujita Mariko (Hokkaido Murrain Otani High School). In the keynote proposal by President Watanabe Jun (Nihon University) entitled ‘Towards developing a network of expressive activities’, a range of activities of the SAOL were introduced as well as the significance of our collaboration with outer circles like the Dramacation Spread Center. A symposium entitled ‘How do we learn and what do we express?’ followed, on the basis of the keynote. 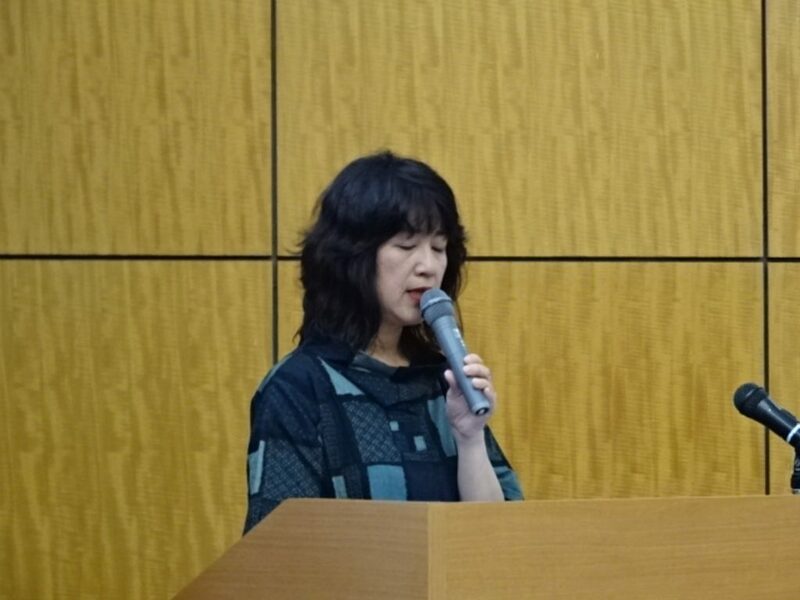 Ms Takeda Fumiko (Ritsumeikan University) chaired the symposium, with speakers from the SAOL (Mr Miyazaki Michiharu, Toho Elementary School and Ms Morozumi Keiko, Saitama Prefectural Tokorozawa Kita High School) and from Dramacation Spread Center (President Mr Mishima Koji and Director Mr Oda Ryosei), who exchanged ideas on their roles in society. After that, Mr Matsumoto Dokan, a lecturer of Dramacation, joined in to give an introductory workshop to Dramacation in three groups. The series of ‘active menus’ such as the ‘janken train’, the participants became intimate with each other although they met each other on the day. The morning sessions ended with an announcement of small groups in which they would experience our workshop in the afternoon. The workshop by the SAOL ‘Presentation festival for adults’ was offered in the afternoon. Mr Wada Toshihiko (Atomi High School), Ms Sugiyama Masuyo (Waseda University), and Mr Fujimaki Akira (Meguro Gakuin Jr & Sr High School) were the facilitators for Group A. 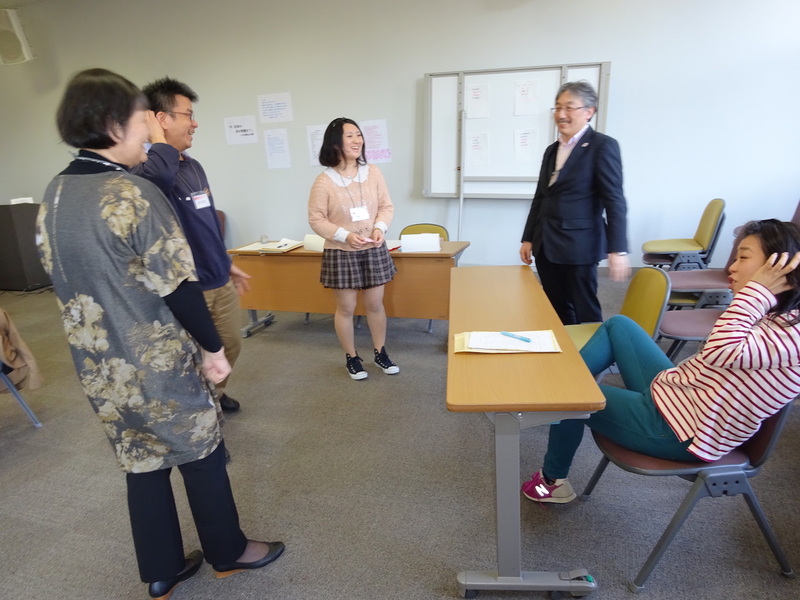 Group B was facilitated by Mr Hayakawa Norio (Nakamura Jr & Sr High School), Ms Misumi Yuko (Tokushima University), and Mr Miyazaki Michiharu (Toho Elementary School). 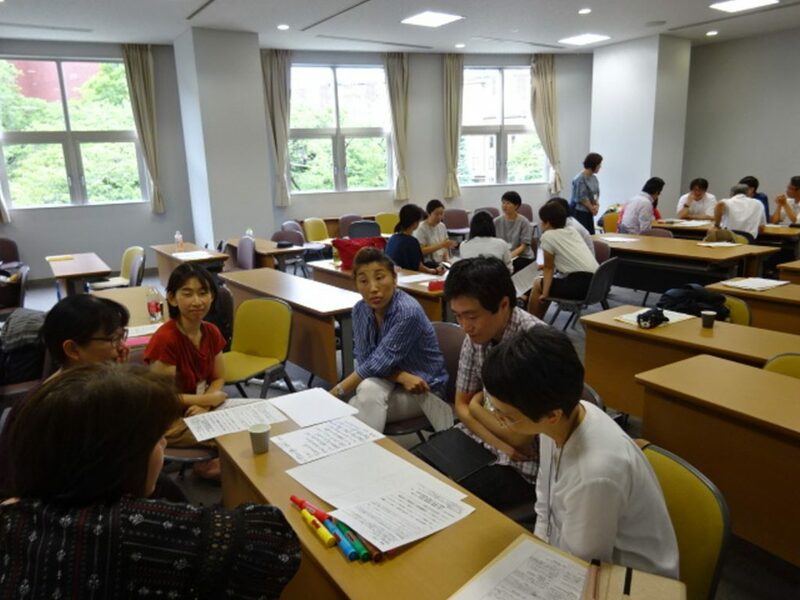 Mr Hayashi Hisahiro (Seikei Elementary School), Ms Morozuki Keiko (Saitama Prefectural Tokorozawa Kita High School) facilitated the workshop for Group C. The theme, given on the spot, was ‘What is the problem in our society now? — Its trend and solution’. The participants were asked to answer the question in the form of a five-minute news show in groups of about five. They had no more than one hour and a half for preparation. After a brief guidance, the participants introduced themselves to their group and told each other what they knew about the theme. Different groups took different approaches to this challenge — some used sticky tags while some others used mind maps. Once they settled on their point of view — ‘hate speeches’, ‘Harmful rumours’, ’Lack of communication skills’, ’TPP and issues concerning succession’, and ‘nuclear power plants’, for example — they quickly moved on to discussion on their message and how best to present it. The rooms were filled with a lively atmosphere with each group taking different approaches. Some stood up from their seats and started thinking while moving, while others took time to have in-depth discussion. Each group gave their presentation in Groups A through C, after which a series of reflection followed. They had a chance to reflect on their presentation individually, in their presentation groups, in Groups A through C, and finally as the whole group of sixty participants. It was expected that these multi layers enable them to gain insights into the educational significance hidden in this pleasant time. Last but not the least, a get-together party concluded the day with Ms Fujita Mariko (Hokkaido Muroran Omani High School) and Mr Tagaya Shozo (Tachikawa City) as the hosts, offering a place for mutual interaction by the participants. With comments like ‘I wish the SAOL gave more chances like this spring seminar,’ the day was also meaningful for the members of the SAOL. This entry was posted in SAOL Seminars on 26/03/2015 by staff. For application or inquiries, click here. Announcing the 8th annual seminar of the SAOL, whose aim is to foster autonomous learners (= autonomous citizens)! The seminar will be our first joint venture with ‘Dramacation Spread Center’, an NPO which develops numerous active menus for workshops at schools, public facilities, and the private sector across the nation. The keynote will touch upon how this collaboration came to be, proposing the meaning of cooperation between groups of expressive education. In the mini-symposium, members of the Dramacation Center and the SAOL will explore possible areas of future collaboration by explaining their goals, state of activity development, and recent activities. The morning workshop will be an opportunity where activity facilitation is explored. Participants can experience programs of human relationship development so that they can offer similar programmes themselves at the beginning of the new school year in April. In the afternoon workshop, participants will discuss ways of instruction using educational presentations on the basis of ‘News shows’, an activity developed by the SAOL. The day will be one for mutual learning about the ideals and instructional methods of the acquisition-oriented learning where the three modes of expression — ‘the language, object, and body’ — are dynamically employed. We await your participation. Hayashi Hisahiro (Teacher, Seikei Elementary School), Komatsu Ritsuko (Teacher, Akita Meitokukan High School), etc. This entry was posted in SAOL Seminars on 25/01/2015 by staff. Our annual spring seminar was held on 27 March. The title was ‘New horizons of educational presentations’. It was joined by more than 50 participants including those from the domain of education. The day started with a warm-up activity (Tagaya Shozo, Cooperator of Tachikawa City Guidance on Lifelong Learning), followed by a mini-symposium ‘Incorporating dramatic approach in presentations’ (Hayashi Hisahiro, Seikei Elementary School; Aoki Sachiko, Showa Women’s University; Sekine Mari, Keimei Gakuen) and a practice report on ‘Presentation festival for high School students’ (Tsujimoto Kyoko, Studio for Cultural Exchange; Yoshida Mariko, Tsuda College). A workshop ‘Presentation festa for adults’ was given in the afternoon. The workshop was an adult version of ‘Presentation festival for high school students’ held in last autumn. A presentation festival is an event where participants, in small groups, prepare a five-minute, dramatic presentation each in two hours’ time. The themes this time were ‘communication gaps’ and ‘generation gaps’. This workshop was different from our previous ones in that we asked the participants to reflect on the programme and facilitation offered by the SAOL, assuming that they had been the facilitators themselves. For more information, refer to the blog by President Watanabe Jun (in Japanese only). This entry was posted in SAOL Seminars on 27/03/2014 by staff.